I am making slow progress on the jet-lag. Today will be a relatively light day for sightseeing since we leave at noon for the airport for our flight to Guilin. After a moderate breakfast of croissants, sweet rolls, several cups of coffee, boiled egg and fruit we took off for a walking tour of old Shu He town. Shu He is one of three old villages that vied for importance with Lijiang, Lijiang having won out as the county seat and tourist center. Due to the early start the streets were almost empty and we could see the residents preparing for the day. A stream flows through most parts of the village with cold clear running water. Until recently it was used for cooking and drinking but pollution has caught up with even Shu He, although we did see several people brushing their teeth at the side of the stream. Now it is mostly used as a refrigerator by the shop owners and restaurants to keep items cold. This valley area was a central location on the Tea Horse Road that provided supplies to all of southwest China and neighboring countries. We visited the museum that chronicled the events surrounding the Tea Horse Road. Again, people greeted us and it was nice that we were not pursued by vendors. It was fun to see the children having fun in the streets and very interesting to see the elderly showing the trials of their life in the lines in their faces. Most of them have spent their lives in one area working hard everyday to provide for their families and their bodies have taken their toll. It is a constant reminder of how good we have it. After checking out of the hotel our guide and driver took us back to Lijiang Old Town before departing for the airport. A Peach Festival had started in the old town square. 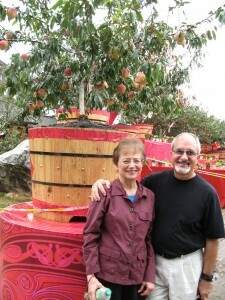 They had brought in several hundred peach trees in containers and many flowers and decorated the square. The peaches are much larger than the ones we have in the States and much firmer but still juicy with a good flavor. (Remember, we stopped on the road on the way to Zhongdian and bought some.) Lijiang Old town was a stark contrast to Shu He Old town. Tourists packed the streets, Vendors hawking goods. A bustling sub-village with one store after another on winding streets. Then off to the airport where we boarded a plane for Kunming on the way to Guilin. We had a scheduled two hour wait that became longer because the incoming flight was delayed. We got to Guilin about 7PM then had a long drive to the hotel. The Guilin metropolitan area population is about 5 million with 700,000 in the city itself. What a contrast to where we have spent the last three days! We checked into the hotel and prepared our suitcases for our river trip to Yangshuo tomorrow morning. No major food reports today.....had a walking lunch of Lijiang pancakes of ham and a sweet pancake made with rose petals. Both very good. The plane fare was fish, sticky rice and green peas!!! 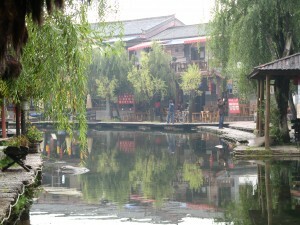 Shu He: Until recently, this village, actually the prototype for Li Jiang, was almost unknown to travelers. For a ¥15 ($2) 15-minute taxi ride, you can escape the thronging hordes of Li Jiang and visit this little village, Li Jiang in microcosm, with two gurgling streams running past every house. There is an old town and a new development with accommodations, restaurants, and even a few bars. At the other end of town is an interesting museum that follows the history of the Horse and Tea Road and features plenty of pictures of Joseph Rock. Look for the very attractive guidebooks of the area, printed on traditional Naxi paper. Entry into the village costs ¥30 ($4) . In the whole Lijiang area, Baisha and Shuhe are another two places protected as "the world culture heritage site" in the Old Town of Lijiang. 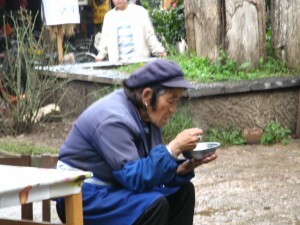 Shuhe is also one of the first settlements of Naxi ancestors. It is not only a very important town in the Tea-horse Road that leads to Tibet, but also a famous cobbler town. The cobblers here are as skillful as those in Italy. The leather products that they make are the best seller in Tea-horse Road. Because of trading activities along this road, the Naxi people gradually gave up the nomadic life and settled for farming and later started to do business.